This absorbing work of historical fiction, patterned after A Day in the Life of Ivan Denisovich, but rooted in much historical fact and great detail, follows four German infantrymen for one day as they fight the 1916 battle of Verdun. Jealously nicknamed "the old folks" because they have survived so well for so long, the "grunts," as we would know them in today's parlance, must perform death defying activities to continue surviving, much less kill the enemy. One fearsome activity is making a run for water and grenades, staples of an infantryman's life. Simply run through "friendly" trenches, synchronize sprints across exposed areas to avoid incoming artillery shells, friendly and unfriendly, pass through more trenches, locate the supplies, attempt to requisition them in spite of general shortages and then reverse the process but with heavy loads swinging from a tree branch on the shoulders of the two supply runners. Additionally, rains have flooded the trenches, washing away landmarks and eroding the trench walls and protection from enemy fire. 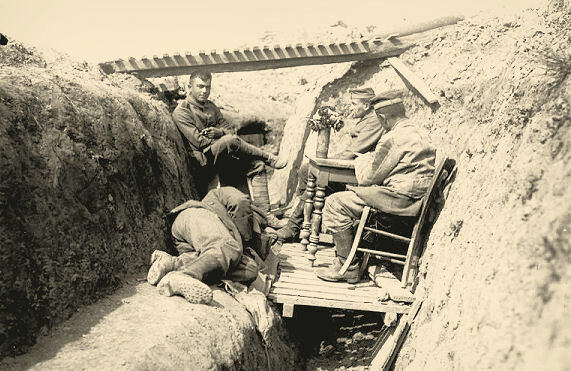 The duckboards at the bottom of the trenches are sinking into the mud. At one point, the supply team comes across a group of men vainly struggling to rescue a soldier from sinking into the mud wolf's mouth. Men did sink into the mud to drown and suffocate. Fortunately this time, the supply team uses a tree limb which is long enough to span the rescue effort and his comrades pull him to safety —minus his pants and boots. The jaws of the mud wolf must be appeased. Another episode concerns the reconnaissance effort of a battle-hardened sergeant with decades of experience who is addicted to the thrill of outsmarting the enemy, killing whenever possible, or just surviving an artillery barrage. We enter his mind as he differentiates between flares and their "hang" time, the different sounds of "friendly" versus enemy machine guns and falling artillery shells, and his reactions to them. The final chapter describes the postwar life of one survivor, suffering from what is now termed post-traumatic stress syndrome. He must travel to the funeral of Paul von Hindenburg, along with many other Wehrmacht survivors. The description of the reunion and the tension with Hitler's SA is chilling as that outcome is too well known. Read this book to learn how death could come in an instant, plus the small details a WWI grunt needed to know to survive. Learn the workings of a soldier's mind as he defends himself from munitions, weather, and his own emotions. Read it to understand that even when the war ended, other ominous struggles began, both personal and national. Thanks for a great review. This is another book I must get and read! "the mud wolf's mouth" - quite a phrase.